You’ll see from this chart and graph that the pace got progressively slower, right from the start, but it was only between 15 and 20km that they dropped below the WR pace, where it remained up to 30km. That period, the inevitable result of the suicidal early pace, would set the race up for surges and survival in the second half. The half-way mark was reached in 61:36, but even that does not account for how fast the first 10km were. It was always going to be a race of attrition, and even this early on, it was clear that the athlete who ran the LEAST positive split would be the winner. The chase group, which included the USA’s hopes Meb Keflezighi and Dathan Ritzenheim were by this stage already minutes behind, and so the winner was coming from this group. The real racing began just before 30km, however, when Hendrik Ramaala (who was running out of his socks) pushed the pace slightly at about 28km. That spurred the big names into action: Wanjiru responded immediately, and then after a moment or two of “calm”, he threw in his own surge. It was reminiscent of the Beijing Olympics, when Wanjiru attacked aggressively off a fast pace. One of the first names to fold under this pressure was Zersenay Tadese, the debutant who had stimulated much excitement. The world half marathon champ, and a man with a 58:59 seems born to run the marathon, but he found this race too hot to handle. That’s perhaps not that surprising, given his inexperience, but it was slightly surprising that he fell off so soon and so quickly. He covered the 5km stretch from 30 to 35km in 16:47, showing that the wheels had well and truly come off for him. In truth, the pattern of the race would not have suited him, especially in a first marathon. Hopefully, he’ll be back in the future. The group of three now formed, it was always a question of who had the most left after the brutal early pace. It turned out to be Wanjiru, though quite how he created the decisive gap, I don’t know. At the time that Wanjiru was pulling clear, we were being treated to glorious coverage of the sixth to tenth women coming over the line. So everyone missed that. Once the men’s race was covered again, Wanjiru led by about 8 seconds from Kebede, with Gharib another five or six down. Kebede was fighting bravely, however, and he managed to very slowly claw back the gap, and had Wanjiru within his reach at the 40km mark. It seemed as though Kebede might have enough to force Wanjiru to sprint for the title, but it was not to be; Wanjiru looked behind and realizing that Kebede was in contact, he surged again and soon managed to open what was the decisive lead. A few minutes later and it was Wanjiru turning right in front of Buckingham Palace, with the title and course record in his sights. He duly went on to break that record in 2:05:10. Kebede was ten seconds back, and Gharib finished in 2:05:27. He was the big improver of the day, since his PB coming in was “only” a 2:07. Martin Lel, who has won London for the last two years, would be the other contender, but failing to make the start line of London with a hip injury means he now has to prove his racing credentials again if he is to be considerd number one in the future. His absence was a big blow, for I’m almost certain he’d have featured in the race. The other name is Haile Gebrselassie. The World record holder has seen his record survive another season, challenged by the 2:04:27 times in Rotterdam, and now this race, where poor pacing may have cost the chance of the record. He’ll no doubt be back in his time-trial mode in Berlin later this year, trying to lower his record further. What a shame that we’ll never know how he would have handled this 28:30 first 10km and Wanjiru’s surges. I still rank him the greatest ever, but he’s only the third best racer in the marathon. 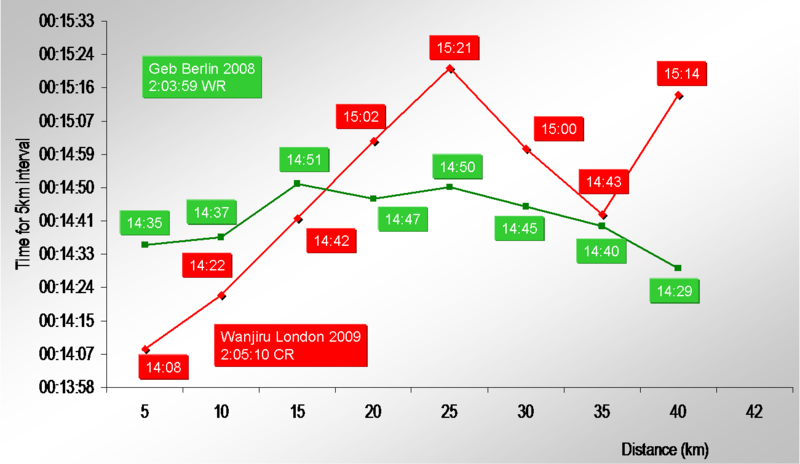 Just to put into context the difference in the London 2009 pacing and Geb’s world record in Berlin last year, the graph below shows the 5km intervals from each. It’s pretty clear that Geb’s world record was achieved with extra-ordinary pacing, as he started a little quickly, then settled down and then got quicker and quicker. Wanjiru, on the other hand, started far too fast, then slowed down far too much, and then threw in surges to win a race, slowing down again at the end. It’s not the ideal way to race. In fact, it’s a pretty poor way to pace the marathon. But perhaps Wanjiru will get himself onto the start line of the Berlin time-trial in October, and then he’ll benefit from the same pacing strategy that saw the 2:03:59. I believe that he’d break that record, on the right day. Then again, so might Kebede, Gharib, Lel, and then Merga and a host of others. All in all, men’s marathon running is in awesome shape, and I can hardly wait for the next batch of marathons in October and November.